The number of end-of-life motor vehicles is increasing in line with the increasing number of newly registered vehicles. End-of-life motor vehicles qualify as hazardous waste due to the substances they contain. The system of decompositions was established in 2004, but less end-of-life vehicles than expected have been included. The target rates of 80% of reuse and recycling, and 85% of reuse and recovery in 2006 and 2007 were achieved. 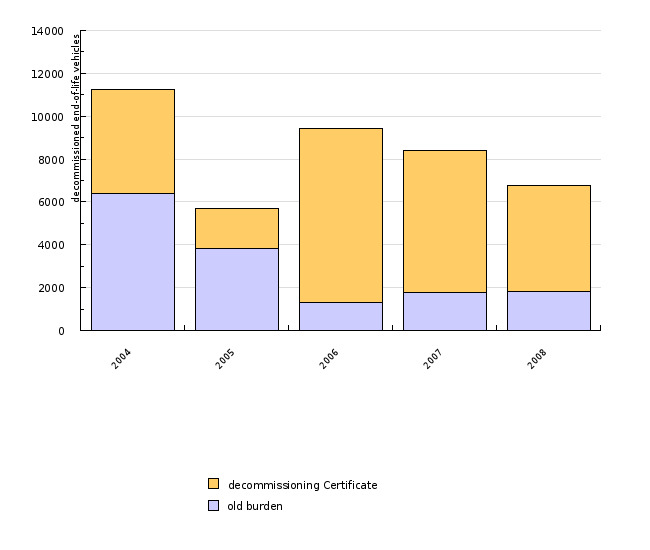 The indicator shows the quantities end-of-life vehicles (ELVs) within the framework of the decommissioning system in authorised recovery centres, and the success in reaching the target percentages of reuse, recovery and recycling of end-of-life vehicles. An end-of life vehicle is an unusable or discarded vehicle that has reached the end of the road by way of its age, collision write-off or other reasons, and has become waste material according to the regulation governing waste management (Rules on the management of end-of-life motor vehicles, Official Gazette of the Republic of Slovenia, No. 118/04). Because of hazardous substances contained, ELVs are classified as hazardous waste. Rules on the management of end-of-life motor vehicles with the purpose of reducing the quantity of discarded vehicles by means of reuse, recycling and other forms of recovery are determined by the Decree on the manner, subject of and conditions for performing public utility service of the management of end-of-life vehicles (Official Gazette of the Republic of Slovenia, Nos. 18/03, 135/03, 32/04, 18/03, 135/03, 106/05, 32/06, 57/06 and 106/06) and the Rules on the management of end-of-life motor vehicles (Official Gazette of the Republic of Slovenia, No. 118/04). In the Republic of Slovenia, the number of newly registered private vehicles has increased up to around 100,000 in recent years. The trend of increase of registered private vehicles is similar; from around 700,000 in the middle of the 1990s, the number has grown to more than 1,000,000 in the last years. Between May 2004 and end of 2007, slightly above 24,000 tonnes of end-of-life vehicles were dried and disassembled in recovery centres, and by the end of 200, 21,000 tonnes of materials and supplies were collected from disassembly for the purpose of reuse, recycling and recovery. For most ELV, the 80% rate of reuse and recycling, and 85% rate of reuse and recovery were achieved. In 2008, slightly bellow 7,000 cars were decommissioned in Slovenia. The system of management of end-of-life vehicles is ensured within the framework of the implementation of public utility service. One of the essential measures for the operation of this system is the introduction of the "certificate of destruction". The last owner of the vehicle that qualifies as an end-of-life vehicle according to the environmental protection rules and the rules on the management of end-of-life vehicles must submit the certificate of destruction upon deregistration of the vehicle. For the last owner the decommissioning service is rendered free of charge. - Some end-of-life vehicles are ‘garaged’ rather than scrapped. The calculated shares in terms of reuse and recycling rate and of reuse and recovery rate for the year 2006 amount in terms of reuse and recycling to 87.17% and in terms of reuse and recovery to 90.35%; for 2007, the figures amount to 87.15% and 88.86%, respectively.